Myth #11: Aerobatics are dangerous. 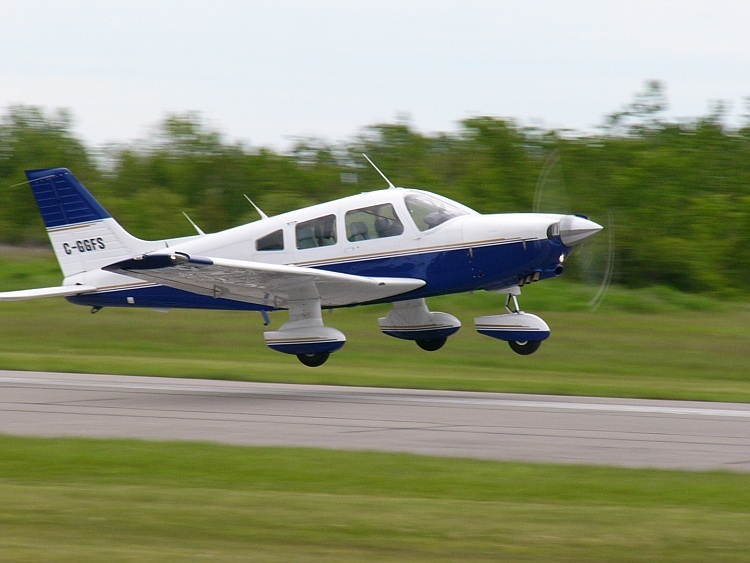 Aerobatic flight has played a prominent part in many fatal accident reports. Sadly, that has given acro a bad name. A more thoughtful analysis, however, clearly shows that many — perhaps most — of those crashes are due to intentional low-altitude maneuvering. When aerobatic flying is pursued in a prudent, intelligent manner with sufficient altitude, the risks are far outweighed by the benefits. Many fatalities come from the world of air shows. Air show flying can be extraordinarily dangerous because there’s virtually no structure or limit on what a pilot is permitted to do. 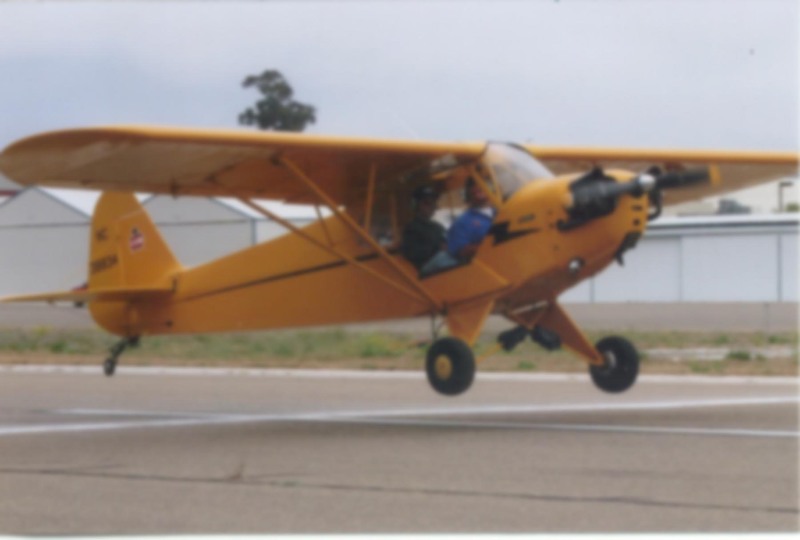 As long as pilots don’t direct the energy of the aircraft toward spectators, a person holding a zero-altitude waiver can perform multiple outside snap rolls starting 1′ off the deck if they so choose. The flying is certainly dramatic, fun to watch, and a demonstration of complex skill. But pilots are free to fly without much, if any, altitude buffer. And many of them do. Competitive aerobatics, on the other hand, is highly structured, limited, and categorized to the specific skill level of individual pilots. The altitude cushion is far higher and the safety record is much, much better. I’ve been involved in competitive aerobatics for eight years and know of only one accident during a competition. The other category of accidents is people with inadequate training, experience, and/or equipment performing low-level aerobatics and buzzing terrain just to try and impress spectators or passengers. I’ve written extensively about why that’s a bad idea. Speaking of buzzing, here’s a YouTube gem of a Bonanza and L-39 flying into IMC while in formation at low altitude. You’ll see the terrain flash by before the Beech loses part of the right wingtip in a tree. Are you starting to see a pattern here? Low-altitude = high-risk. When you take out the low level stuff, aerobatics becomes a much different thing. There’s room the screw up a maneuver, laugh about it, fix it, and still be far above the ground. That’s safe. That’s sane. I’m a big proponent of aerobatics because in my experience, nothing does more to build up a pilot’s stick-and-rudder skills and confidence than the precision, proficiency, and control demanded by quality aerobatic flight. An inadvertent spin, wake turbulence encounter, or other upset is far more likely to be handled properly by a pilot with aerobatic training. Aerobats are comfortable with full control deflections, odd sight pictures, high pitch/bank/yaw rates, accelerations, and sounds which can cause the straight-and-level crowd to freeze up, panic, or even worse, aggravate the situation with improper control inputs. 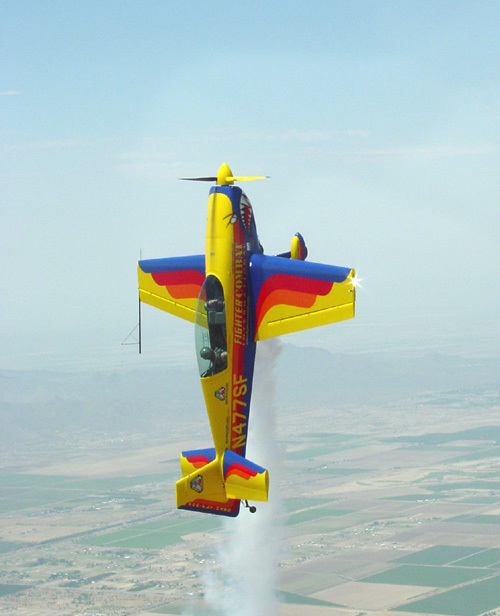 Myth #12: “Aerobatics” means exceeding 60 degrees of bank and/or 30 degrees of pitch. Notice how there are no specific bank or pitch angles attached to the definition? That’s why a 45 degree pitch angle after takeoff in a Cub would be considered aerobatic (it’s not necessary for normal flight), whereas flying solo in the Pitts S-2B, that same pitch angle would be just about right for holding a normal Vx climbout and therefore, NOT aerobatic in nature. The FAA’s definition is simple and elegant, yet also allows for the differing performance characteristics of each aircraft type. Myth #13: A spin in the pattern is unrecoverable. This myth is demonstrably false. I’ve performed thousands of spins, and every plane I’ve spun eats up about 500′ of altitude from entry to recovery during a full 360 degree spin. Of course, that assumes the guy in the pilot seat can effect recovery properly and do so within 360 degrees of yaw. Might we have yet another argument for spin training? I think so. I’m not suggesting you try a spin from a typical 1,000′ AGL pattern altitude. That would fall into the “low altitude follies” category of myth #11. But to say that a spin in the pattern is unrecoverable is just false. With even a little practice, it’s not hard to recover from an inadvertent spin in less than a quarter of a turn. That would eat up but a couple hundred feet of altitude and be more of a wing-drop than anything else. I’d even go so far as to say that if you doubt your ability to stop a stall-spin entry from 1000′ AGL and recover to level flight before hitting the ground, you need to get some instruction before proceeding further. With sufficient training, the recovery technique will become virtually automatic. Idle power, full opposite rudder, lower the angle-of-attack. Myth #14: Exceeding 30 degrees of bank in the pattern can lead to a stall/spin. I was at an uncontrolled airport one day watching pilots do their thing, when a student pilot entered the pattern and announced her intention to land on runway 25. On her first attempt her Cherokee blew through the final approach course and she wisely went around. The next time she did the same thing. The third attempt was a larger pattern with an earlier turn to final which resulted in an undershoot. Trying to fix that, she allowed her glidepath to get too high. Another go-around. By this point the student was pretty rattled and, I’m sure, more that a little embarrassed by her inability to land. You could hear it in her voice as she made various radio calls. After four or five attempts someone had to talk her down via the radio. What the heck had happened, I wondered? Was there an abnormally high wind aloft just pushing her through the final? Was she turned loose by her instructor with insufficient training? Perhaps there was a mechanical problem with the airplane. Was the traffic on the CTAF too distracting? Maybe she was from a quiet country airport (as if we have any of those in Southern California…). Further investigation revealed that her CFI had taught her not to exceed some arbitrary bank angle in the pattern. I don’t remember if it was 20 degrees or 30. Maybe it was 15. The exact figure is not important. This poor lady’s instructor had told her that the way to avoid an inadvertent spin in the pattern was to limit her bank angle. For a long time I thought her CFI’s instruction was terrible, but thankfully not common. Unfortunately that’s starting to change. I even see this kind of advice provided by AOPA in their publications now! A quick Google search turned up an AOPA Safety Publication where the author suggests limiting base-to-final turns to as little as 15 degrees. I am in agreement with teaching 30-degree banked turns in the pattern, for all the reasons mentioned. But I make an exception for the turn from base to final. The pilot flying this traffic pattern has begun his turn early, using a much shallower bank–perhaps 15 to 20 degrees. The result is a somewhat sloppier-looking, but safer, pattern. It gives the pilot more time to assess the effect of any crosswind and adjust his turn to smoothly intercept the final approach course. Because he starts the turn to final with a shallow bank angle, he can safely increase his bank (within limits) to counter an overshoot. Likewise, there should be little reason to tempt the pilot to skid. Even if he does, at the shallower bank this is much less likely to result in disaster. Check out the stall speed versus bank chart in your aircraft’s flight manual. Although a pilot who increases his bank from 30 degrees to 45 degrees and one who increases it from 15 to 30 are both increasing by the same number of degrees; the effect on stall speed is much more dramatic in the first case. The stall speed only changes if one is maintaining level altitude flight during the turn. Who makes a base-to-final turn like that? The bottom line on this issue is that it’s wrong to attach a specific bank angle to safe flying or spin avoidance, regardless of whether it’s in the pattern or elsewhere. Maintain the same load factor on the airplane during the turn and the stall speed doesn’t change whatsoever! You can spin a plane from wings-level flight. That how most intentional spins are performed, actually. Likewise, you can continuously bank a plane a full 360 degrees, turning in the opposite direction while you do so, and neither spin or stall. It’s called a rolling turn — a competitive aerobatic maneuver. Let’s go over it one more time: spins are only possible if the airplane is allowed to exceed the critical angle-of-attack while in an uncoordinated state. It has absolutely nothing to do with airspeed, bank angle, altitude, or proximity to the traffic pattern or runway. If the poor girl flying that Cherokee had been properly taught, she would have avoided tremendous stress, embarrassment, and risk. Myth #15: Flying is difficult. This last one is for the non-pilots. I wish I could tell you that it takes super-human effort to fly, that only a steely-eyed genius with hand/eye coordination even the best video game gurus could never hope to possess can operate an aircraft. That’s what many passengers seem to think. Alas, the truth is that physically flying most airplanes is not hard. Landing can be a bit of a challenge, especially if your standards are high and you want to nail it every time. But the taxi, takeoff, climb, cruise, and descent are pretty easy. I’ve had total neophytes do all the flying on many occasions. I’d only take over for the last few seconds before landing. It’s just not that hard. Now, learning the regulations, aerodynamics, aircraft systems, meteorology, navigation, emergency procedures, signage, ATC communication, aeromedical factors, decision making, performance calculations, and the dozen other areas one must master in order to fly in today’s world? That’s a bit tougher. But the physical act of flying an airplane is not as hard as aviators would like to make you think. Glider pilots are taught to keep the speed up in the pattern and make all turns at 45 degrees — gliders usually don’t have enough elevator authority to stall at 45 deg. so that’s considered the safest turn. As long as the turn is (and stays) coordinated, there’s no problem with any bank angle. I think airplane CFIs don’t put enough emphasis on proper rudder use. Hmmm, I was never taught any specific bank angle when I learned to fly gliders. Even for the 200′ AGL rope break, my CFI never specified any bank angle beyond the general advice to keep the turn radius relatively tight. I’m quite certain you can stall a glider at any bank angle and any airspeed if you’re willing to pull hard enough on the stick. The SGS-233 I was flying had about 10,000 hours on it, so I tried not to be any more abusive to the bird than was necessary, but there’s nothing about a glider’s design which makes it impervious to reaching the critical AOA. The most efficient bank angle for “engine out” procedures is 45 degrees. I was taught this by my CFII who was a retired navy flight instructor and this is the same reason it is employed in flying gliders. I practice this frequently to remain proficient with this procedure of a fairly steep bank angle at low altitude but always descending and in coordinated flight. Springbok. Thanks for letting me know about the dead link–that’s one of the problems with 3rd party hosted content, it just disappears without warning sometimes.